Detroit Mercy Psychology graduate student Christina Nguyen has received the Michigan Tutorial Association’s (MTA) Tutor-of-the-Year Award. She was honored at the MTA Connections Conference on Friday, Nov. 2, at Wayne State University. Susan Trudeau, director of Detroit Mercy’s Student Success Center, nominated Nguyen based on her dedicated service and commitment to students, and desire to help them achieve success during their academic careers. “Christina exemplifies mission initiative and compassion in her work. Moreover, her joie de vivre makes her a magnet for so many on campus in the SSC and beyond. She understands what students need and more importantly how to deliver it. She truly deserves this honor!” Trudeau said. 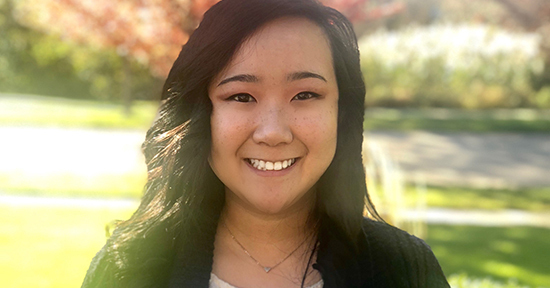 Nguyen graduated from Detroit Mercy this year with a bachelor’s degree in Developmental Psychology and is a first-year graduate student in the School Psychology program. This year marks her fourth year as a tutor at the Student Success Center. Part of her responsibilities include serving as a mentor for other tutors.